The band's second LP, Revelation will be released via Nuclear Blast on August 23. It was produced by Schenker and Michael Voss, and recorded and mixed by Voss at Kidpool Studio Greven & Kidwood Studio in Münstertal, Germany. Revelation features Gary Barden, Graham Bonnet, Robin McAuley, Doogie White and, on one track, Ronnie Romeo of Ritchie Blackmore’s Rainbow on vocals. Simon Philipps played drums on the album, while Bodo Schopf will take his place as the band's permanent drummer moving forward, due to scheduling conflicts for Phillips. 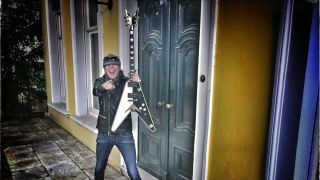 Michael Schenker Fest also announced that they would be embarking on a North American tour next month. You can check out the band's full itinerary below.